The author’s tagline describes it perfectly: “Love, Laughter, and Happily Ever After.” Another delightful installment in the “Weddings by Design” series, Bouquet of Love is part My Big Fat Greek Wedding and part Meet Me in St. Louis with a dash of Food Network thrown in for good measure. Cassia Pappas loves flowers. Her dream job is to work in a flower shop, designing bouquets and arrangements, and she has the training and skills to do it. Unfortunately for Cassia, her family is in the throes of opening a new sandwich shop in an unfamiliar town and her father expects—makes that demands—that Cassia will pull her weight in the family business. Being a good Greek daughter Cassia reluctantly toes the line, but she can’t help but wonder what God and her “Babbas” had in mind when they abruptly uprooted the family from their Santa Cruz home and dropped them on Galveston Island off the coast of Texas. It’s bad enough having a father who dresses up in tights and a cape to promote “Super Gyros” but when Babbas declares all-out war with the pizza place across the street things really get uncomfortable. Especially when Cassia lands a part-time job at a flower shop and starts making friends . . . who all seem to be related to the pizza-making Rossi family. Awkward. They’re such nice people, too. If only Babbas would stop yelling long enough to listen for a change, but it may take an act of God (and his family) to make that happen. 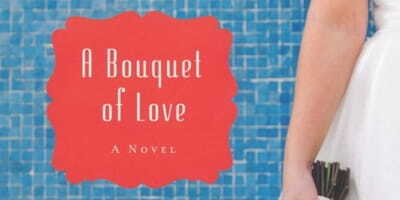 The plot of Bouquet of Love borrows heavily from Meet Me in St. Louis, but that’s no bad thing. A good love story can take a little updating, especially when matters of faith are stirred into the mix. So when Cassia spots the gorgeous Alex, to paraphrase the Trolley Song, “Zing! Zing! Zing went her heartstrings.” Just imagine what happens when Alex turns out to be the flower deliveryman who makes regular stops at the flower shop. Not only that, he’s half-Greek! Hmmm, maybe this is why God brought the Pappas family to Texas. And maybe that’s not the only reason. Looks like the Lord has some work to do in Cassia’s entire family. Cassia is a joy to hang out with; her story is told in first person so it’s like sitting down over a delicious Greek lunch with a good friend. Warning: don’t even think about reading this on an empty stomach. The mouthwatering descriptions of gyros and pizza and chocolates and baklava and so on will soon send you out in search of sustenance. Each chapter opens with a “you know you’re Greek when…” statement that’s not only funny, it explains a lot about Cassia and her family. Fans of the first three volumes in the Weddings by Design series will enjoy catching up with characters from earlier stories, but it’s not necessary to start at the beginning of the series to enjoy Bouquet of Love. This sweet little story stands on its own.